Growing a new business can be very challenging. You may ask yourself, “How do I tell people about my services? How do I get my name out to those that may be interested in my product?” There are many different ways you can use to market your new company. One of the most innovative ways to do this is by hosting strategic events. Events can help you build the visibility of your organization and gain awareness from your ideal customers. There are many types of events you can host to help achieve this when starting a new company. Some are more specific to the industry than others, such as hosting a family and friends dinner at a new restaurant or having a grand opening offering discounts at a new store. This article will explore some event ideas that can be implemented across all industries. Before we get into the types of events, here are a few things to keep in mind when planning your event. The most crucial element to consider is the return on objective. Don’t host an event just for the sake of it. When you plan your event, think about how it is increasing the awareness of your organization or its capability to help build your customer base. “The most crucial element to consider when planning a strategic event is your Return on Objective.” Tweet this! 1. What is the objective of this event? 2. Will I be able to generate any new business leads? 3. How will I measure the success of the event? 4. What is my follow up plan? The next thing to consider is how to manage your time wisely so the event is successful but does not distract you from running your new business. Given the stress of starting a new company, consider hiring an event planning company to help you with all the finer details. This not only frees up your time during the planning process but also allows you the freedom to enjoy the day-of-event and mingle with prospects. An event manager can help you choose the right location, select catering everyone will enjoy and book entertainment that suits the environment of your event. Some companies, like Executive Events, will also help you determine your event objective and put metrics in place to achieve your event goals. Rather than worrying about event logistics, you can network and build relationships with your attendees. Finally, don’t forget about social media. Create accounts for your organization on the platforms your ideal client frequents. Consider using hashtags and posting pictures and information for each of your events. There are many great ways to use events to build out your public profile. Adding your event information to appropriate social platforms is a fantastic way to extend the life of your event. Now, let’s explore some effective ways to promote your new business through events. Consider hosting a launch event. Capitalize on your event by inviting the media and high-profile members of your community in addition to your ideal clients. Remember to give them a compelling reason to attend. For media invitations, don’t just send out a blanket press release. Target journalists who have written about what you’re marketing. Even online bloggers with influence in your industry can be more helpful than just trying to get every major news outlet to attend. Utilize the staff you have in public relations, marketing and sales to attract the right network connections and sales prospects. If you don’t have those departments in your company yet, sit down and make a list of those in your community that could purchase your product or service. Who are the types of people that you help most with your new business? Give people a reason to come. New businesses launch every day, what makes yours special? You’ll have a captive and diverse audience in one room. Capitalize on this by keeping the information interesting and finding ways to make your event unique. Consider incorporating a demo of your product or doing a giveaway for something exciting. You could incorporate your event hashtag as part of your game for a prize. The winner could be the person who gets the most likes, comments or retweets. This has the added benefit of getting your new business some extra social media exposure. Finding ways to make your event exciting and unique is something you can work on with your event manager. Don’t forget to acknowledge the people who have helped you get to the point of being able to launch a business. Showcase your employees, investors, and other partners during the event. Not to be confused with the official business launch event, this event is targeted to one offering you want to feature. Both launches have significant benefits for your new business in terms of attracting key people and giving you one-on-one time with them. The product launch allows you to make more targeted sales. Consider choosing a venue that reflects your product or service. Are there conferences or expos that happen in the same venue year after year in your industry? See if you can find space in that venue. Choosing a location synonymous with your product will help you to build a reputation in the field. This event is more product or service specific than the business launch. This is where you get to show off your product with demos and a more in-depth explanation of its uniqueness. Utilize the same key focus areas mentioned in the business launch; attract the right people, give them a reason to come, and don’t forget to acknowledge the people who helped you build the product or service you’re featuring. You just got your business started but you’re already concerned with how to keep customers and clients. This is common for all new businesses; the first five years are always when you must work the hardest to ensure people keep coming back. This is the time that sets the precedence for years to come. Hosting an event to celebrate the first year you’ve been in business and thank those who have helped you achieve that success can go a long way. The focus here can just be expressing thanks to your existing clients, customers, and network. And less on hard sales. You will still find return on investment through this type of event by retaining those you are already in business with. “Hosting an event to celebrate the first year you’ve been in business and thank those who have helped you achieve that success can go a long way.” Tweet this! Going a step further, you may consider hosting casual drop-ins every month or two. Such as a wine and cheese night or an industry-specific activity. Give your network and customers access to your office to ask questions without having to schedule an appointment. Invite them to drop in to say hi or bring a friend or colleague in who may be interested in your business. Supply some food or drinks and have a casual open-door policy where you and your staff are available to chat with anyone who comes by. Don’t forget to allocate some of your budget to attend events also. Find events where your ideal customer will be and make sure to have a presence there. This gives you even more opportunity to build your network and generate prospective business. All these events can help you cultivate your business network and connect you with valuable opportunities in your community. Consider meeting with a strategic event company to plan out the first year or two of events that you will host. Be strategic in your timing. Research conferences or industry weeks that you can time your event to work in conjunction with. Or create a stand-alone event that fills a gap in the market. 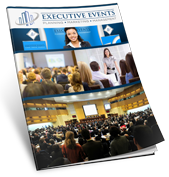 Our team at Executive Events has experience in helping businesses execute promotional events. Contact us today to learn how a strategic event can help you promote your business.